Caldecote A v Marston Reserves. Picture: David Kay. Daniel Stafford, Phil Matthews, Joe O’Donnel and Ritchie Bevan scored the vital goals against United replies via Tim Larrier and Liam Whitmee Craig pulling them clear of AFC Oakley M&DH who were on Britannia Cup duty. Now just goal difference behind M&DH in third spot are Renhold United who ran out 3-1 winners at Shefford Town & Campton. Wes Lewis, Jason Allison and Alex Liburd were on the United scoresheet against a lone Town reply from Andrew Hayday. Now up into fourth are Caldecote who took their unbeaten run up to seven games by winning 2-0 at second from bottom of the table Ampthill Town Reserves, where both Stewart Haddow and Nicky Albone found the back of the net. Whilst climbing into fifth place are AFC Kempston Town & Bedford College who were 2-1 home winners over Ickwell & Old Warden. Courtney Boughton saw his brace of goals only replied to once by Zak Rowe. However, the highest scorers of the day were Wootton Blue Cross with a 5-1 home victory over Sharnbrook to take their unbeaten ways up to five games. Lui Sarrington with a brace was joined on the scoresheet by Jack Downes, Jamie Lovell and Robert O’Dell to bring up the nap hand against a lone reply from Jim Burnside. Sandy still remain in search of their first win of the season after going down 0-3 at home against Marston Shelton Rovers, Dylan Porter netting twice and Lewis Steele once. Whilst Stevington’s five game winning run was brought to an end when they were held to a 2-2 home draw by Kempston Rovers Development. Reece Williams and Thomas Roberts were on the home scoresheet against a brace in reply from Ollie Benham. Current cup holders AFC Oakley M&DH now face a trip at the quarter-final stage to Wootton Blue Cross after winning 2-1 at Wilstead, Jack Weeden and Nathan Aulsberry on their scoresheet against a home reply from Paul Jones. Queens Park Crescents remain unbeaten on the road this season and now seven points clear at the head of the Division One supported by Wests Citroen table after winning 7-2 at Shefford Town & Campton Reserves. Shahinur Rahman led the way with a hat-trick, Ayaz Hussain netting twice and single strikes coming from Daniel Rasol and Fabio Sattar against home replies via a Chris Clark penalty and Dave Young. Second place Crawley Green Reserves lost ground on the Crescents after being held to a 0-0 draw at third place Henlow. For fourth place Totternhoe Reserves, who remain very much in the promotion race, their unbeaten run stretched to eight games with a 4-1 victory at Cople & Bedford SA. Joe Smith with a brace was joined on the scoresheet by Jack Capethorn and Jonny Clarke against a lone home reply from Ollie Hughes. Now slipping out of the promotion race are M&DH Clapham Sports who were beaten 2-5 at home by a AFC Kempston Town & Bedford College Reserves side winning their fourth away game on the bounce. Kurtis Alleyne scored a brace alongside single strikes from Michael Sexton, Kegan Roberts and Giovanni Moscaritolo brought up the nap hand against home replies from Liam Bolton and Sam Maddix. Elsewhere, Old Bradwell United Reserves were claiming their first home win of the season with a stunning 7-1 victory over The 61 FC Luton Reserves. Barry Rooney netted four times, Charlie Wells twice and Lewis Baker once against a lone reply from Tim Akwrele. There is no change at the head of Division Two following wins for the top two clubs. For leaders Wixams it was a 4-2 home victory over Caldecote Reserves where Gareth White claimed a hat-trick and Rob Malcolm netted once against visiting replies via Harry Elkin and Sean Bent. Second place Riseley Sports remain 100% on the road this season after winning 2-0 at Houghton Athletic thanks to goals from Josh Poole and Jack Healy. Exchanging third and fourth spots are Cranfield United Reserves and Atletico Europa after United ran out the 2-1 home winners at Crawley Road. Jack Sharman Dodd shooting them ahead in the fifth minute only to see Tanden Jankovic level matters 10 minutes later to then see Sharman Dodd hit what turned out to be the winning goal 10 minutes from the half-time interval. Still very much in the promotion race are fifth place Flitwick Town Reserves who took their unbeaten ways up to six games when winning 3-1 at Lea Sports PSG who were duly losing their seasons unbeaten home ways. Mark Bartlett scored twice and Dan Pool once against a lone PSG reply from Kieryon Bonnard. Elsewhere, AFC Oakley M&DH Reserves took their unbeaten run to five games with a 3-1 home victory over Sundon Park Rovers. Justin Muircroft, James Grandidge and Sean Hendry scored the goals to do the damage against a lone Rovers reply via Chris Scott. Marston Shelton Rovers Reserves are back on top of Division Three after winning 4-2 at Caldecote A, Dale Maiciw with a brace joined on the Rovers scoresheet by Gary Russon and Carl Borromeo against home replies via Neil Giles and Tony Norman. The victory lifts them above Wilstead Reserves who were beaten 2-1 at now unbeaten in their last 10 starts and third place Renhold United Reserves. Michael France and Ashmeet Chana on the United scoresheet against a lone reply from Liam Philp. However, perhaps still the title favourites are fourth place Bedford Albion who saw their game at Sandy Albion called off after joyriders had vandalised the Albion pitch. 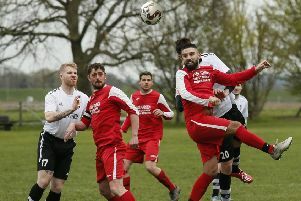 Meantime, Kempston Athletic brought their five game losing run to an end by sharing the spoils in a 1-1 draw with Wootton Village, Sam Queeley netting for the Athletic and Jay Rogers for the Village. CS Rovers’ quest for the title took another step forward when they retained their unbeaten away record by winning 2-0 at bottom of the table Lidlington United Sports thanks to goals from Connor Darocha and Luke Roddy. Whilst second place Clifton saw their 100% away record disappear after they were held to a 2-2 draw at Flitwick Town A. Dave Lyons and Josh Arthur Kent were on the Town scoresheet against Clifton replies via Dylan Donaldson and Johnny Cole. Elsewhere, Stevington Reserves were held to a 1-1 home draw by AFC Kempston Town & Bedford College A . Martin Williams the home goalscorer and Marian Sobczyk netting for the Town.